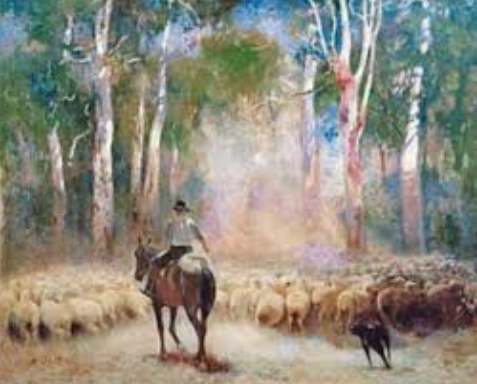 The short story 'His Masterpiece' was written by famous Australian poet and writer, Andrew Barton 'Banjo' Paterson. The works of the author are well known in Australia. His song 'Matilda' is considered as part of the folklore in Australia--a kind of unofficial anthem of the country. Even the coin in Australia has the picture of Andrew Barton 'Banjo' Paterson on it. The plot of the story is simple. One stockman (in Australia it is a person who looks after livestock), tells the story that happened to him in the Northern Territory. This region is very difficult to access. People who lived there were respected by others. All stories were taken at face value by people who had never been in that area. As the author said, "When two of them meet, however, they are not fools enough to cut down quotations and spoil the market; they lie in support of each other and make all other bushmen feel mean and pitiful and inexperienced." The main character told the story how he coped with a problem when a huge livestock of sheers went out of his control. They were frightened by the possum (it is an informal name of the opossum - a tree-dwelling Australasian marsupial that typically has a prehensile tail). The narrator caught them on the old horse while riding through the bushes. For the readers it didn't look as an extraordinary deed, but for the listeners of this story - the stockmen, it was surprising. The author presented a contrast of the simplicity of the story with a pretentious title, "His Masterpiece". It was made deliberately to present the beauty and meaning of life of ordinary people, the inhabitants of Australia. The language and vocabulary of the story convey some specific Australian features. All together, they created the atmosphere of the place and time. His masterpiece is the ability to survive in a wild Australian nature and to cope with everyday difficulties.